Honda India has launched the 2018 Navi in the country at Rs 44,775 (ex-showroom Delhi). For 2018, the Navi comes with a much-needed analogue fuel gauge for its tiny 3.5-litre fuel tank. Other additions include a metal exhaust heat shield, new body-coloured grab rail, headlight cover and rear view mirrors. The 2018 model also features a red finish on the rear springs. Two new colours, Ranger Green and Ladakh Brown, add to the already existing Patriot Red, Shasta White, Sparky Orange, and Black. 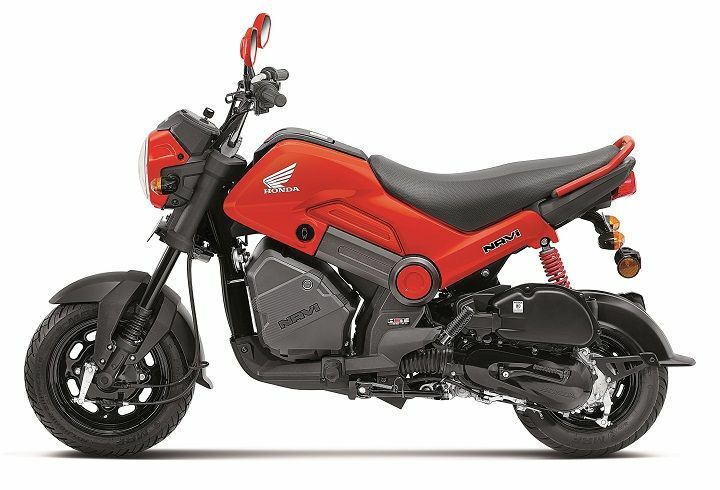 New Delhi, July 20, 2018: Honda Motorcycle and Scooter India Pvt Ltd (HMSI) today launched the new 2018 edition of NAVi with new stylish fuel gauge and metal muffler protector which provide for extra convenience. Complementing existing utility package, all new body coloured elements- grab rail, headlight cover, rear view mirrors and sporty red colour cushion spring add to its FUNtastic looks. The 2018 NAVi will also be available in two new vibrant colours - Ranger Green and Ladakh Brown. Disrupting the monotony and bringing FUN to 100-110cc segment, NAVi is the first 100% developed model by Honda R&D India i.e. from the concept development to commercial production. Taking forward Honda’s fun DNA, NAVi promises a world of unlimited possibilities. Honda NAVi is powered by 109cc engine which makes 8PS at 7,000 rpm and delivers a peak torque of 8.96Nm at 5,500rpm gets tubeless tyres. It gets upside-down telescopic forks at the front and a hydraulic monoshock at the rear. The NAVi available at an attractive price of Rs. 44,775 (ex-showroom Delhi). The standard NAVi is available in 6 colour options: Patriot Red, Shasta White, Sparky Orange, Black, New Ranger Green, New Ladakh Brown.